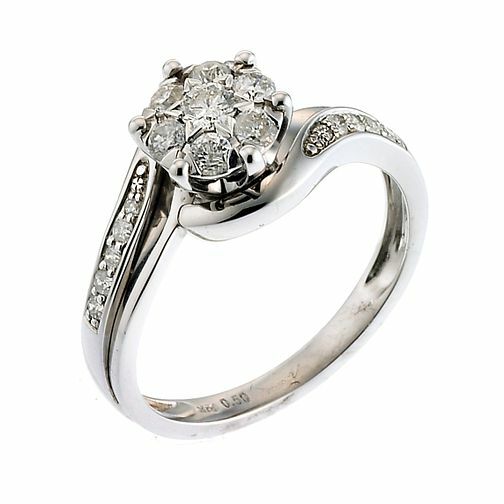 A stunning combination of half carat diamonds and 9ct white gold. This elegant ring is sure to take her breath away with its intense cluster of diamonds and scattering of dazzling stones down the shoulders. 9ct White Gold Half Carat Diamond Ring is rated 4.5 out of 5 by 16. Rated 5 out of 5 by Anonymous from Gorgeous, looks far more expensive than it is Me and my fiancée chose this together for my engagement ring. It was between this and a more expensive one from a competitor brand and I am so glad we went for this, I get so many compliments. Only downside is that it slips round a lot due to the size of the stones, I'd prefer a thicker band to help this. I had it taken down a few sizes and then they tell me once the wedding ring is underneath it will be prefect and I trust this.